Not that it’s hard to find a reason to love summer, but one element in particular that I love is the simplicity of summer cooking. And while I try not to use the oven too much, it’s hard to argue with a dinner that practically makes itself. This is a light dish, so I suggest either doubling it or serving it alongside another salad or dish of choice. Based off this recipe of Martha Stewart’s, the only changes I made were replacing the Cantal/Cheddar with Pecorino, and I didn’t have thyme on hand but it was still delicious. Pre-heat oven to 375 and lightly coat a 9x13 inch casserole/gratin baking dish with olive oil. 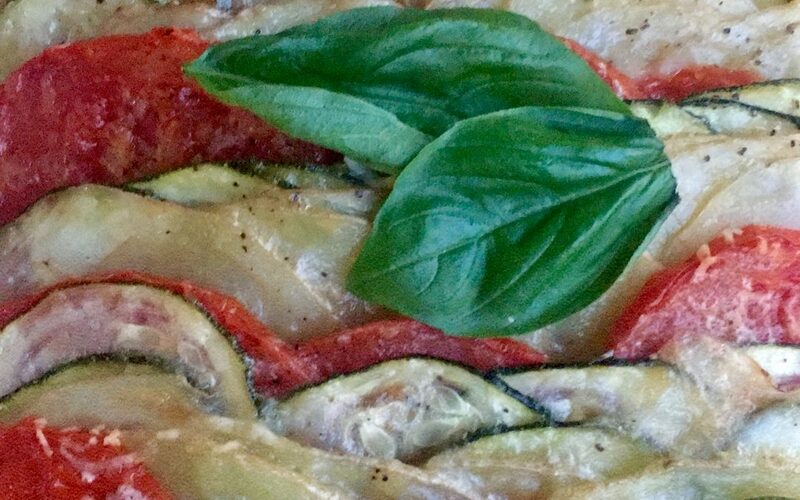 Arrange potatoes, zucchini and tomatoes in overlapping layers in the dish. Sprinkle the salt and pepper, drizzle the remaining olive oil over vegetables. Sprinkle cheese on top. Cover with tin foil or parchment paper weighted down with an oven-safe lid, bake for 35 minutes or until potatoes are tender. Remove covering and bake for an additional 20 minutes, or until top is golden.